Good morning! Meal Prep Monday post for you today! Oh my goodness, hasn't it suddenly gotten colder this week? It felt like the summer was going on for a lot longer than usual, and then BANG, Saturday hit us with a cold front, heavy rains, and super strong winds. Totally time for some heartier meals. 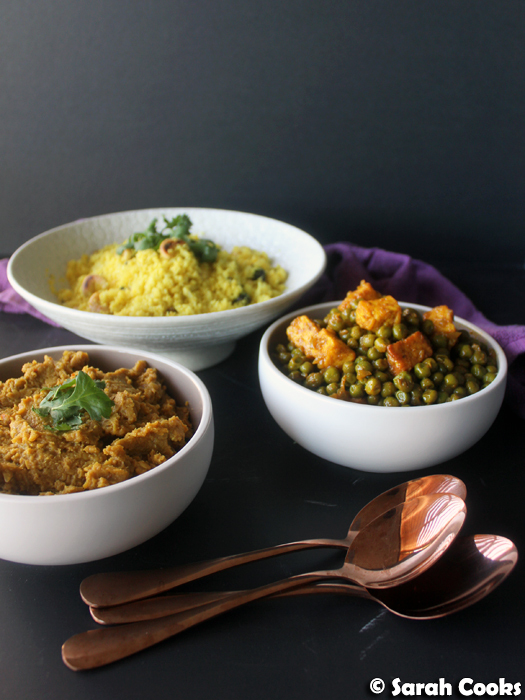 So for today's meal prep, we've got an Indian-inspired combo of: muttar paneer, red lentil dhal with cauliflower rice pulao. 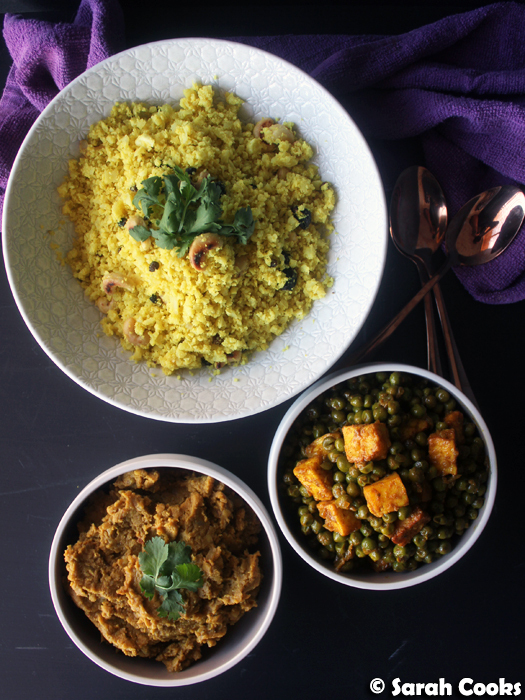 I wanted a comforting meal with vibrant flavours, but I didn't want it to be too heavy or rich, and I still wanted lots of vegetables, fibre and (vegetarian) protein. This was the perfect combo. You may remember I gushed about the cauliflower rice pulao in a previous post, and the red lentil dhal was a component of a previous Meal Prep Monday post (there I served it with spiced roast potatoes and cucumber raita - fabulous). So the new component for today's meal prep is the muttar paneer curry - or peas and cottage cheese. I use Nigella's recipe from Feast. (I actually blogged about it 13 years ago, as part of another "Low-Carb Indian!" post). Looks like this is my go-to for Indian food when I'm trying to eat healthily. One thing to note, these recipes do make pretty generous quantities. My usual meal preps are enough for four meals, but this makes enough for about eight meals, depending on how hungry you are. I ate it for lunch and dinner throughout the week, and enjoyed it so much that I was happy to do so! If you don't like repeating meals, I'd suggest either sharing it with your family, or freezing individual servings for future meals. 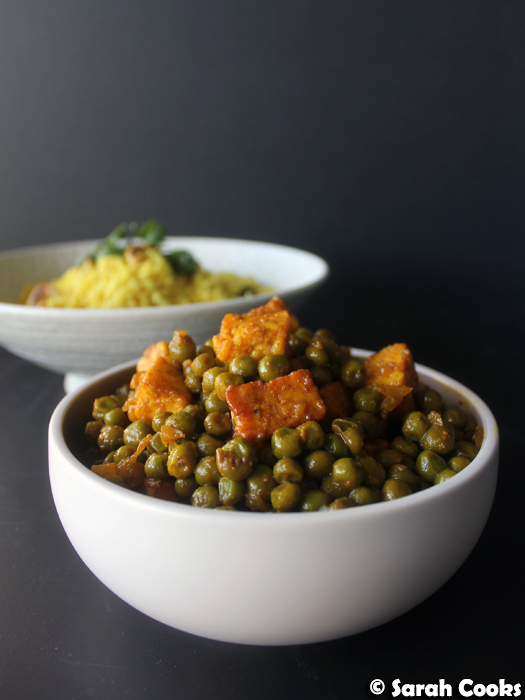 Alternatively, to make enough for just four meals, halve the quantities of both the muttar paneer and the dhal, or make a full quantity of just the muttar paneer or the dhal. (I'd leave the cauliflower as it is). However, as I mentioned above, I was eating this meal all week, and was still really happy about it on the last day. Apart from tasting fabulous with all the different spices, I found it filling and substantial without being stodgy. Even though I was going with a carb-free alternative to rice, it didn't feel like I was depriving myself - it was just delicious! Heat the oil in a large pan, big enough to take everything later. Finely chop the onion, mince the garlic, and grate the ginger. Add onion, garlic and ginger to the pan with a generous pinch of salt, and cook, stirring, until the onion is translucent. Add the turmeric powder and garam masala and stir through. Add the frozen peas and stir to coat in the spice mixture. Stir the tomato paste into the vegetable stock, and then pour into the pot with the peas. Bring to a robust simmer, then turn the heat to low. Cover with a lid and simmer for 5 minutes. Stir in the (still frozen) paneer cubes, cover and simmer for a further 5 minutes. Remove the lid and simmer for a further 5 minutes, or until the cheese is heated through and the liquid has thickened slightly. 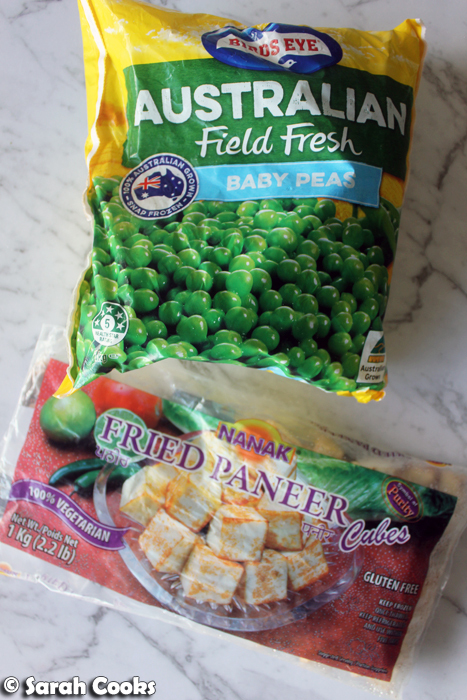 Note: If you can't find frozen fried paneer cubes, buy fresh paneer and cut into rough 1.5 centimetre cubes. Fry the cubes in oil (be careful of splatters) until golden brown all over. Drain on paper towel and set aside while you make the peas. Add the cheese cubes to the peas at the end of cooking time. Make the red lentil dhal from my previous post, but omit the spinach and chickpeas. Make the cauliflower rice pulao from my previous post. I love this curry! And it's great for a meal prep Monday because it would only improve with the days too :D I might make a version with tofu one day.